Jib Crane Range: Capacities from 80kg up to 2000kg with various lift heights & jib lengths available. Finishes available are: Mild Steel, Aluminium, Galvanised & Stainless Steel. Mounting Options: Ceiling, Floor or Wall Mounted & Mobile Base. Types of Jibs: I-Beam or Enclosed Track, & Low Headroom. Lifting Devices: Jib Cranes can be fitted with Manual, Electric or Pneumatic Hoists, Load Balancers, Vacuum Lifters & Various types of Clamps & Grabs. Installation, Testing, Certification & Operator Training: These all are carried out by our own fully trained & experienced staff. 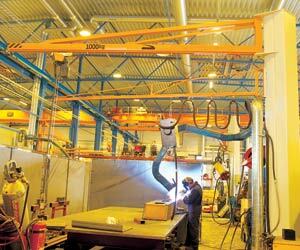 Our Jib Cranes are used in a lot of industries. e.g. in the Woodworking or Joinery trade, we fit vacuum lifters to our Jib Cranes for lifting & handling doors, windows & sheets of MDF, Plywood & Chipboard etc. In the Steel Fabrication trade we also install Jib Cranes with vacuum grippers for handling various types of sheet metal of all dimensions & surface finishes. In the Food, Pharmaceutical & Chemical Industries we would install either an Aluminium Jib Crane or Stainless Steel Jib Crane fitted with electric chain hoists, pneumatic chain hoists, vacuum lifters or load balancers for handling drums, sacks, reels, cartons & boxes. In the Electronics industry we install our Jib Cranes fitted with electric chain hoists, pneumatic chain hoists, vacuum lifters or load balancers for handling PC’s, Servers & Switch Gear Enclosures etc. 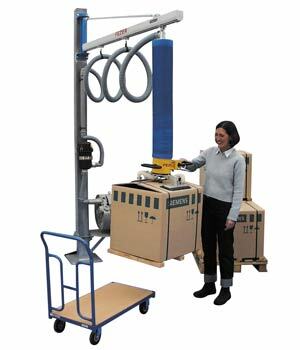 The primary function of Ergonomic Lifting Products is to reduce operator fatigue. By combining light weight construction techniques with a roller bearing pivot, we have developed a jib crane that is not only light weight, but also produces a minimum amount of pivot friction making it one of the easiest moving jib cranes available. Not only does this ease of movement reduce operator fatigue, it also reduces wear and tear on vacuum lift tubes and allows the operator to work closer to the jib crane pivot more easily, increasing the available work envelope for a given span. When adapting Ergonomic Lifting Products to existing work spaces or trying to save valuable floor space in new work spaces we often find ourselves trying to fit equipment into a small obstructed area that was simply not designed to allow adequate space for traditional types of equipment. With the ability to operate in constrained spaces and around obstructions the Articulating Arm Jib Crane can provide a simple and economical solution to these problems. In addition the design of the Articulating Arm Jib Crane requires minimal headroom and the end of the outer boom can be notched for even lower headroom requirements. With four mounting styles including Wall Bracket, Base Mount, Top Mount, and Portable Base and a variety of Spans and Capacities available, the Systems Design Articulating Arm Jib can be combined with a Vacuum Lifter, Electric or Pneumatic Hoist, or Tool Balancer, to provide simple solutions to complex lifting problems. We can also provide customized units to meet your specific requirements.